Imaging in three dimensions rather than two offers numerous advantages for machines working in the factories of the future by granting them a whole new perspective to view the world. Combined with embedded processing and deep learning, this new perspective could soon allow robots to navigate and work in factories autonomously by enabling them to detect and interact with objects, anticipate human movements and understand given gesture commands. Certain challenges must first be overcome to unlock this promising potential, however, such as ensuring standardisation across large sensing ecosystems and increasing widespread understanding of what 3D vision can do within industry. Three-dimensional imaging can be achieved by a variety of formats, each using different mechanics to capture depth information. Imaging firm Framos was recently announced as a supplier of Intel’s RealSense stereovision technology, which uses two cameras and a special purpose ASIC processor to calculate a 3D point cloud from the data of the two perspectives. A random dot projector can also be part of the solution to improve the accuracy of the cameras for indoor applications. Photoneo takes a slightly different approach to 3D vision with its PhoXi 3D scanners, using a laser light pattern projector that emits a set of coding patterns onto the target scene, which are interpreted by a single camera and used to reconstruct a point cloud. The PhoXi capturing and processing pipeline is capable of delivering 16 million measurements per second, either in 3.2 megapixels at five frames per second, or 0.8 megapixels at 20 frames per second. 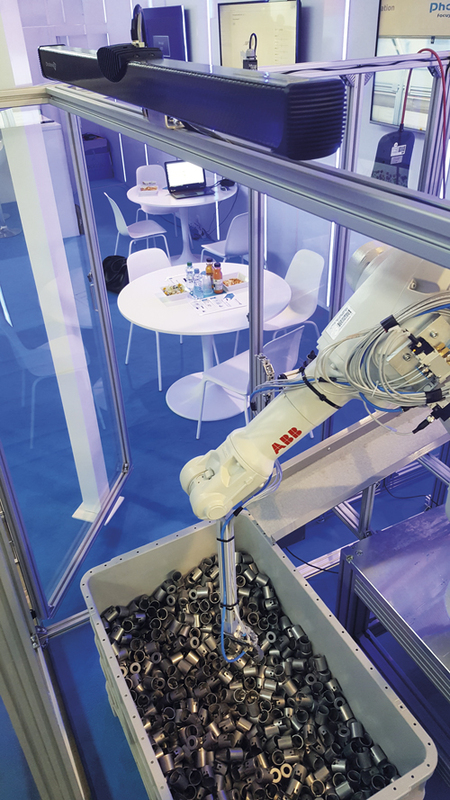 PhoXi scanners are suitable for robot handling applications for bin picking, where randomly placed, semi-oriented objects can be picked from a container or pallet and placed on a conveyor belt. Time-of-flight (ToF) is an alternate and relatively new method of 3D imaging that relies on the consistency of the speed of light to calculate distances and generate point clouds. It uses the time it takes the pulses of camera-mounted LEDs to reflect off objects and return to the image sensor of a camera. Odos Imaging provides its StarForm-Swift camera for ToF imaging, offering VGA resolution and 40 frames per second with a precision from 1cm at ranges up to 6 metres. The platform uses seven LEDs outputting 850nm infrared light as the illumination source, and outputs a point cloud that can be used for tasks such as palletisation in logistics, carton dimensioning and profiling, completeness checking and agricultural growth management. Camera manufacturer Basler’s ToF offering also provides VGA resolution and a precision of 1cm, at 20fps and at a range of up to 13 metres. The system also uses one extra 850nm LED for illumination. Imaging in the infrared can make ToF cameras susceptible to sunlight, so to reduce this effect Basler’s ToF camera features structures around its lens that block out stray sunlight and other reflections. According to Hebbel, 640 x 480 pixels (VGA) is the highest resolution currently available for ToF imaging. ‘Because the technology is so new at the moment, the 640 x 480 pixels resolution … can be used for most applications, because there’s simply no higher resolution ToF cameras on the market, as the sensors don’t exist,’ explained Hebbel. ‘VGA is a sweet spot that delivers sufficient angular resolution to be able to see small objects at long ranges. However, it is also small enough resolution that the data generated is easily manageable,’ Logan added. While ToF requires little processing to output 3D images, gigabytes of uncompressed data are still produced that need to be stored and processed. Manipulating imaging data at the edge, also known as embedded processing, is an area of increasing momentum and discussion in the vision community, and involves storage and manipulation of information near the source of capture. 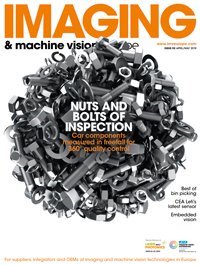 Doing so enables smaller, more compact imaging systems and a range of new applications in areas where traditional vision systems would struggle to perform. Embedded processing, while increasing the capability of vision systems, introduces certain factors that need to be accounted for when being deployed, according to Hebbel: ‘If processing is done locally then a lot of energy is needed to run numerous processors, which requires a large battery that will affect the performance of any autonomous vehicles or drones that it’s attached to.’ This will therefore have to be taken into consideration when equipping robots and vehicles with embedded vision systems to allow them to navigate and interact in future factory environments – a key role for vision technology in Industry 4.0. ‘Understanding of the environment by robotic systems will be a big game changer for the new industrial revolution,’ stated Puliš, of Photoneo. ‘Robots, as machines, are nearly perfect, being precise and robust, but they are blind. With 3D vision, they will get their eyes. Their usage will be much wider with improved flexibility. Vision-equipped logistics robots are a potential example, offering the ability to pick up containers and move around a facility autonomously. Imaging in 3D would enable them to anticipate structures and objects, recognise where humans are, and understand where they are going and how to navigate around them safely. Simultaneous localisation and mapping (SLAM) algorithms will play a key role in this, as they enable a machine to produce a digital map of its surrounding environment. According to speakers at the recent EMVA Embedded Vision Europe conference in Stuttgart, SLAM was difficult to achieve only two years ago; however, recent developments have turned it into a reality. Further advances in deep learning could extend this perceptive capability to robots being able to understand gesture commands from humans, allowing them to stop or move out the way when told to do so. In implementing these applications, a 3D camera would be used to record the spatial information of the gesture, which would then be inputted into a range of middleware for body, facial and gesture recognition, and understood using deep learning. These kinds of processes are still currently under development, according to Scheubel, who also explained the increasing processing power and the low price of 3D imaging is driving the development of these natural interactions with devices. Deep learning software is also enabling this technology and is developing at incredible speeds because of progress made by companies such as Google, Amazon and Apple in the consumer market. The challenge of integrating 3D cameras into these future environments, according to Hebbel and Scheubel, is to combine and standardise them with other sensors. ‘Having them as part of a real-time system that changes environment as it moves around a building requires the development of huge ecosystems between a number of sensors from different partners, which is very complicated to achieve at the moment,’ confirmed Hebbel. One of the main challenges 3D vision providers are facing is an absence of proper knowledge on the subject within the industry, according to Photoneo’s Puliš. ‘A lot of customers have a lack of information about 3D or they have obsolete information,’ Puliš said. ‘This causes distrust of 3D and represents a barrier for further development. With the accuracy, distance and cost of 3D imaging set to improve with future technology developments, this larger market will lead to the vision format finding its way into a range of new applications, both industrial and commercial. While Basler’s and Odos Imaging’s ToF cameras use infrared LEDs as the illumination source, structured lighting and laser illumination systems manufacturer Osela is in the process of introducing a new laser-based time of flight illuminator (TOFI). It emits nanosecond laser pulses in 685nm, 808nm, and 860nm and provides uniform illumination that maintains optical power density over long ranges. The TOFI can be used in any ToF application, according to Nicolas Cadieux, CEO of Osela. However, Osela only provides the TOFI for ToF camera manufacturers – integrated in the camera housing – or to end users that want to develop their own ToF system. As opposed to traditional LEDs, where the divergence of light is very high, the TOFI’s laser format dramatically reduces the loss of light and enables high homogeneity. This makes it ideal for high energy pulse delivery in long range industrial depth sensing applications, eye-safe gesture recognition and volume measurement. Requiring only a 5V power supply, the circuitry of the TOFI provides high current pulses by a simple low impedance high speed digital signal. This allows it to output 2W of power with rise and fall times of less than 1ns.